Should you keep your horse stabled or in a loafing shed? If you are keeping your horse at home you will need to provide some sort of shelter. This could be in the form of a stable or a run-in shed. A safe, roomy shelter is a necessity if you are keeping a horse. 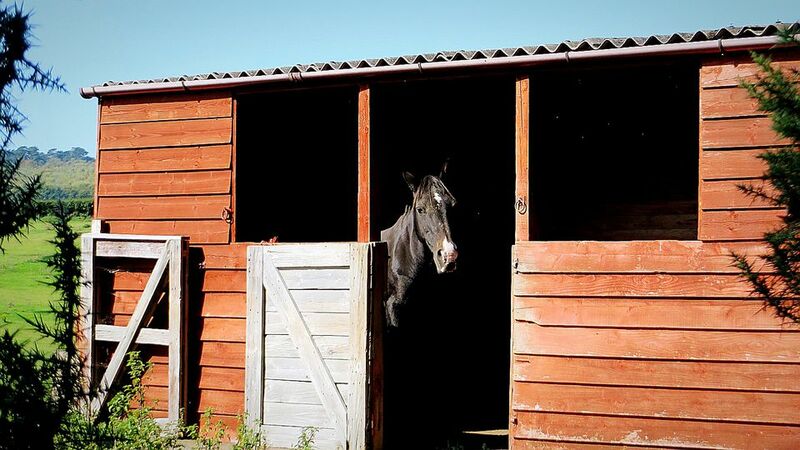 If you have no shelter, you should have stabling with either roomy standing stalls or box stalls. Whether you chose to have a run-in type shelter, or have a stable with stalls there are advantages and disadvantages to both types of housing. Less work for the owner. Sheds may only need periodic cleaning that may be done with a tractor. Horses choose when they are in the shed. Better ventilation, therefore, healthier for lungs. Can be built relatively inexpensively. Can be bought in kits with minimum assembly required and with size and engineering in compliance with local building bylaws. Some designs are portable and can be moved according to weather, drainage or to another pasture to allow the grass to recover in one area. No way to contain a horse that needs stall rest due to injury or sickness. Horses may have to be separated if concentrates are fed. Handling such as grooming and saddling not as convenient. A horse may not choose to come out of bad weather when they should. Depending on wind direction, horses can still be exposed to drafts. Dominant horses may not allow lower status herd members into the shelter. Horses requiring stall rest easily accommodated. Grooming, saddling, training may be easier. Complete shelter from wind and weather. Lower status horses not threatened by dominant herd members, and horses can be moved if threatened. Horses may stay cleaner i.e. : Stabling before a show the horse can't roll in the dirt. Feed consumption and manure production easier to monitor. Higher costs for building and maintenance. Stalls need daily mucking out. Higher dust levels, ammonia, and poorer ventilation. Horses can become bored and develop vices more readily in stalls. Horses must be exercised daily.